he River Breamish ambles nonchalantly into life on the remote southern slopes of Cairn Hill, a satellite of Northumberland`s highest hill, the mighty Cheviot. However, the river soon begins to show a little more urgency and starts to jog towards the tiny hamlet of Ingram on the edge of the Northumberland National Park, a journey just short of 10 delightful miles. Along the way, the river cuts a deep, narrow valley through the surrounding hills and, for the first 2½ miles, from Breamish Head to the isolated farm of Low Bleakhope, the valley is almost pencil straight. Then, met by the vertigo inducing, north-west facing flanks of the 1732 feet high Shill Moor, the river makes an abrupt 90° turn. 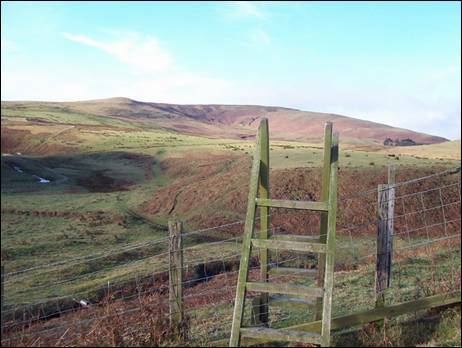 It then embarks on a `drunken` meander as it wriggles past the lesser heights of Ritto Hill, Hartside Hill and the spectacular hillfort-topped Brough Law. The lower reaches of the Breamish Valley have been popular with generations of weekend picnickers, many of whom rarely venture further than the 1908-built Peggy Bell`s Bridge, which sits below the scree-shattered slopes of Brough Law, except perhaps to visit Linhope Spout, the area`s best known waterfall. t is not a particularly high hill nor is it especially remote, but the position of Shill Moor makes it a superb vantage point. 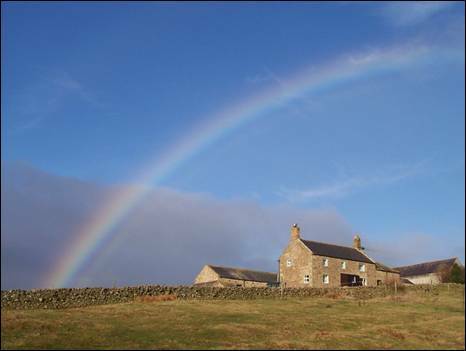 An excellent 6 mile circular walk to the top of this rarely-visited hill starts immediately before the buildings of Hartside Farm (Grid Reference NT 976162), just less than 3 miles beyond Ingram, at the end of a narrow single track public road. There is ample verge parking. The tarmac road continues as far as the settlement of Linhope from where a rough track heads uphill towards the impressive Linhope Spout. However, your route starts by turning left before the farm, following the signposted track to Alnhammoor. Within half a mile the track crosses the River Breamish via a 1952-constructed bailey bridge and then climbs gently away from the river past the mid-19th century farmstead of Alnhammoor. The sweep of Shill Moor dominates your view ahead as you continue along the Low Bleakhope bound road. Once past a small plantation, on your right, which contains a handful of Scots Pine, the road begins to bend gently towards Snout End and an irresistible route to the summit of Shill Moor. This is now your cue to bid adieu to the tarmac road and to begin your upwards journey. There are a number of quad tracks up the hillside to your left, so be sure to take the one which lies on the extreme right and starts at the bottom of the dip in the road (Grid Reference NT 953157). The good, green track helps to ease the strain of a fairly steep, bracken-clad gradient and as you continue to gain height on the winding track you will eventually pass a tiny walkers cairn. This is the perfect spot to catch your breath and to admire the fine views over the surrounding countryside and to the far distant coast. Continuing on, you will soon spy the rugged summit cairn high on the horizon and when you draw parallel to this, leave the track to your left and make a 50 yard uphill bee-line to the post and wire fence. The cropped heather-covered summit of Shill Moor lies immediately beyond. rowned with a rambling cairn, wrapped loosely around a concrete triangulation pillar, the top of this hill (Grid Reference NT 944153) is an outstanding viewpoint. It is easy to imagine that you are standing alongside the red carpet at the premiere of a widescreen, blockbuster movie. The stars arrive one by one; Hedgehope Hill, Comb Fell, Cushat Law, Hogdon Law, Dunmoor Hill and, finally, the leading lady, The Cheviot. The North Sea coast provides a splendid backcloth to the east. Triangulation pillars have been a familiar feature of our landscape since 1935 when the Director General of the Ordnance Survey launched the re-triangulation of Great Britain. Surveyors then began the `mountainous` job of building these concrete pillars on scores of remote hilltops. Deep foundations were dug by hand and heavy loads of materials were dragged over isolated and often difficult terrain by lorry, packhorse and, in some instances, sheer brute force. The gargantuan task of creating this network of pillars was not completed until 1962. The pillar on top of Shill Moor was one of 6,557 in the network of which 314 were known as `primary` pillars. The remaining 6,243 were `secondary` pillars and `filled the gaps` between the `primary` ones, the nearest of which stands on the summit of The Cheviot, some 4 crow-flown away. 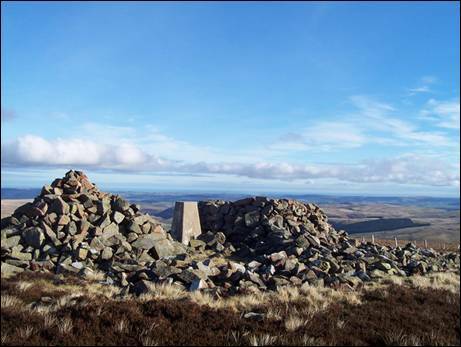 Nearby `secondary` pillars can be found on Wether Cairn, Bloodybush Edge and Hedgehope Hill. With the advent of satellite technology, the vast majority of triangulation pillars have now fallen into disuse and whilst the Ordnance Survey retain a database of their locations they have no interest in the current state of repair of individual pillars. A number of groups of enthusiasts have "adopted" individual pillars in the network and keep them in good repair. fter fully enjoying every angle of the summit view, return to the fence, cross over and turn right. Keep in very close contact with the fence and on reaching the second five bar gate, pass through. Now follow the track and wind your way down the grass covered hillside, passing as you go a small rocky outcrop. The views throughout the descent remain outstanding, with the conical Hogdon Law now demanding your full attention straight ahead. Soon you will reach the flatter ground of the Salter`s Road, a medieval cross-country route once used by traders for the transport of salt from the North Sea coast saltpans to Scotland. The route was also used by smugglers and thieves and, at one time, was known as the `Thieves Road`. These are quieter days and now it is a popular walking route which can be followed through the Northumberland National Park from the tiny hamlet of Alnham to the English/Scottish border at Hexpethgate. Your route now turns to the left and heads south-east along the green track of the Salter`s Road towards Little Dod. On reaching the arrowed fingerpost (Grid Reference NT 950142), just short of the inconspicuous top of this 1266 feet high hill, turn left and follow the track across the slopes of Scaud Knowe. 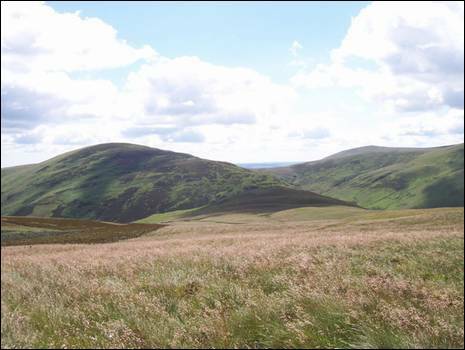 Take a quick look at the Ordnance Survey map of the Cheviot Hills and you will see that a number of locations in the area include the word `knowe` as part of their name. This simply means `a small hill or shoulder of a hill`. The Shank Burn lies to your right and the green track now gives easy, downhill walking with the occasional directional fingerpost keeping you `on the straight and narrow`. To your left there are excellent views of Ritto Hill and the granite tors of Great and Little Standrop. 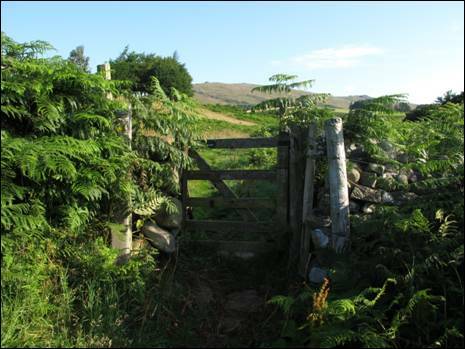 After a short while you will cross the Rowhope Burn, before climbing to a ladder stile which leads you to the rear boundary wall of Alnhammoor farm. Continue in the same direction until a directional fingerpost is reached and, at this point, turn left through a small gate. Walk straight across the small field, with the buildings of Alnhammoor above you on your left, exiting over a step stile (Grid Reference NT 971154). 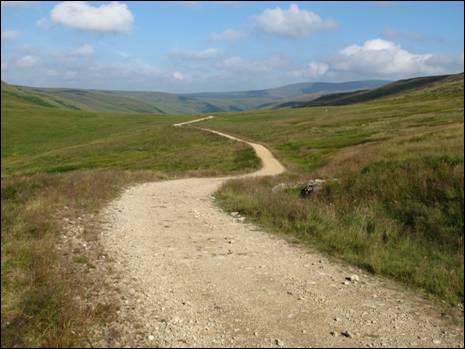 Now turn right along the tarmac road, which will be familiar from your outward route, and after little more than half a mile of further walking you will be back beside Hartside Farm. This article first appeared in the February/March 2009 Issue of THE NORTHUMBRIAN MAGAZINE.